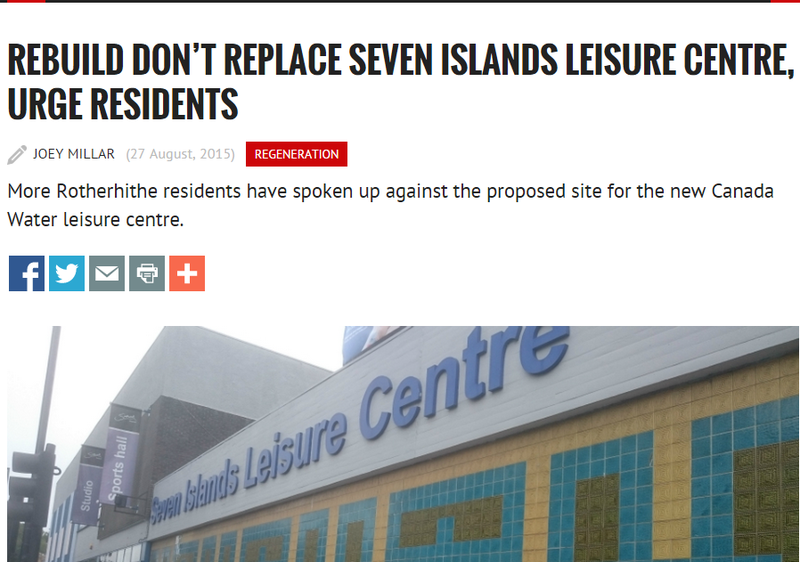 Southwark News has run another article on our cause, this time focusing on the strong case for refurbishing the Seven Islands leisure centre rather than tearing it down and building a new one on a wildlife area just metres from residents’ back doors. It also highlights controversial comments by Southwark Council leader Peter John, who is accused of “trying to shut down discussion” of the issue. The article can be found here. Meanwhile, The Wharf newspaper and website has also caught up with the growing local backlash against the Southwark Council and British Land plan. You can read that piece here. This entry was posted in Uncategorized and tagged British Land, Canada Water Masterplan, Canada Water West Residents Action Group, Joey Millar, Seven Islands Leisure Centre, Southwark Council, Surrey Quays, Wildlife. Bookmark the permalink.